Sen. Wendy Davis, D-Fort Worth, left, reacts as time expires following her lengthy filibuster. A bill that opponents claimed would virtually ban abortion in Texas failed to pass late Tuesday after lawmakers missed a deadline by just minutes. There were chaotic scenes after a filibuster attempt fell just short and protesters cheered, clapped and shouted from 11:45 p.m. to midnight and beyond as lawmakers tried to hold the vote before the session ended at midnight (1 a.m. ET). The filibuster by Sen. Wendy Davis, D-Fort Worth, who wore a back brace, lasted almost 11 hours but ended after three challenges to her speech were upheld. The only way Democrats in the Republican-controlled Senate could defeat the measure was by not letting it come to a vote on Tuesday. 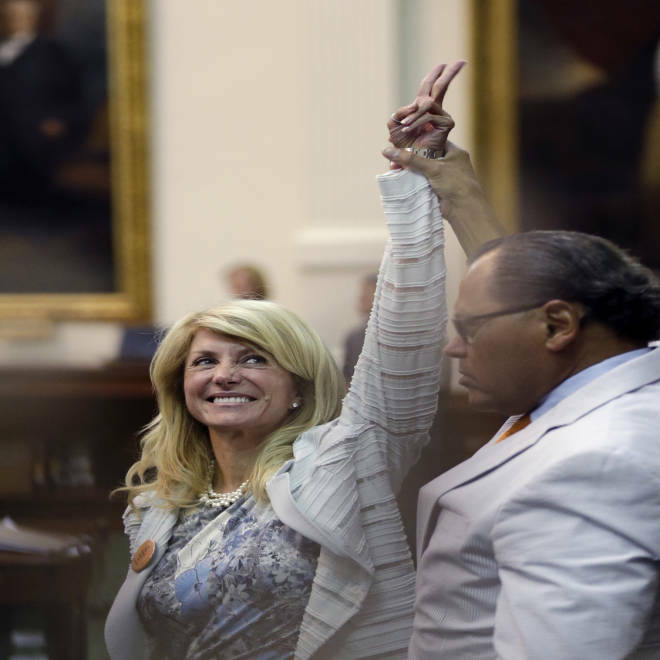 Democratic Texas state senator Wendy Davis took over the statehouse floor for a successful marathon filibuster of an abortion-related bill that began Tuesday morning and ended 13 hours later, causing the vote on the bill to miss the deadline. NBC's Kelly O'Donnell reports. Lt. Gov. David Dewhurst, acting as Senate president, initially said the voting began just before midnight, NBCDFW.com reported, and several reports suggested that the bill had been passed after a 19-10 vote and would go to Gov. Rick Perry. But Dewhurst later announced that the vote had been held too late. Dewhurst may have hinted Gov. Rick Perry could immediately call another special session, when he told the Senate: "It's over. It's been fun. But see you soon." He condemned the protesters for staging what they described as "a people's filibuster." "I didn't lose control (of the chamber). We had an unruly mob," the Associated Press quoted Dewhurst as saying. Davis said "my back hurts" after the vote, and added, "I don't have a lot of words left." "It shows the determination and spirit of Texas women," she told the AP. 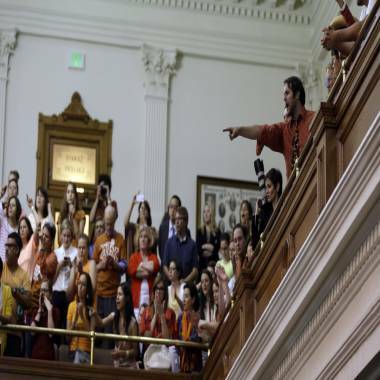 Spectators in the Texas Senate chamber protest a halt to Sen. Wendy Davis' filibuster against an anti-abortion bill. She celebrated victory on her Twitter account early Wednesday. The measure would have banned abortions after 20 weeks of pregnancy and would have required all clinics to be graded as surgical centers, with all doctors required to have admitting privileges at hospitals. It's estimated that nearly all of the state's clinics wouldn't have been able to meet the new standards. Unlike during famous filibusters in Washington, D.C., when senators talked about anything that came to mind to fill the time, Davis was required to speak nonstop and on topic without sitting down or even leaning on her desk for support. She read the stories of witnesses those who didn't get to speak before a Senate committee discussing the measure last week, before moving on to analyzing the bill itself, the Dallas Morning News reported. Members of the gallery cheer and chant as the Texas Senate tried to bring an abortion bill to a vote as time expired late Tuesday. But Republicans won rulings that Davis broke the rules - for getting improper assistance from a colleague who helped her adjust her back brace and for straying from the topic. In a show of support for Davis, President Barack Obama tweeted Tuesday night: "Something special is happening in Austin tonight. #StandWithWendy"
But then, late Tuesday night, Davis ran afoul of a three-strikes-and-you're-out rule when Dewhurst upheld an objection that she had strayed from the topic again, this time by discussing a 2011 law involving sonograms and abortions, which he ruled was non-germane to the abortion bill. That opened the door for the Senate's Republican majority to call for a straight up-or-down vote to end Davis' remarks. A series of motions, appeals and parliamentary inquiries on that order followed. As midnight neared, raucous cheering and shouts erupted from the gallery during a roll call vote and the disruption - seen on a live video stream of the session - halted Senate action for several minutes, which it was eventually established had prevented the vote.